Showcasing ancient sites, priceless art, outstanding cuisine, and unique lodgings. Discover the city’s most famous sites, including the Roman Forum and Colosseum and the Vatican. Enjoy a wine tasting at a local winery. Experience the best of Italy’s countryside and its famed cities on this special small group tour, which showcases ancient sites, priceless art, regional cuisine, and unique lodgings, including a restored Tuscan villa. Starting in Italy’s Campania region, visit haunting Pompeii and sunny Sorrento from your base in the stunning seaside resort of Amalfi. During three days in Rome discover the city’s most famous sites, including the Roman Forum and Colosseum and the Vatican, and enjoy ample free time. Then it’s on to Umbria and Tuscany to explore their medieval hill towns—Orvieto, Assisi, Deruta, Siena, San Gimignano—and enjoy a wine tasting at a local winery. In Florence the Renaissance comes alive on a walking tour that features some of Michelangelo’s sublime masterpieces and Brunelleschi’s stupendous cupola on the Duomo. Conclude in magical Venice, with a tour of St. Mark’s Square and time on your own to explore the city. This morning experience this breathtaking coast by sea on a cruise from your hotel to Amalfi Center (weather permitting). Here enjoy a brief tour of the region’s largest town, then have lunch on your own. In the afternoon, ascend to mountaintop Ravello, with its spectacular gardens and coastal views. A full-day excursion begins with a tour of Pompeii, the city devastated by the eruption of Mt. Vesuvius in A.D. 79 but not excavated until 1748. You'll then embark on a breathtaking drive along the winding Amalfi Coast high above the azure Mediterranean: with stops for photos along the way and in Sorrento. Return to the hotel late this afternoon. En route to Rome today visit the town of Montecassino, whose abbey is the mother church of the Benedictine order and a center of medieval art. A German stronghold during World War II, the hilltop abbey was destroyed by Allied bombing then rebuilt as a replica of the 17th-century original. 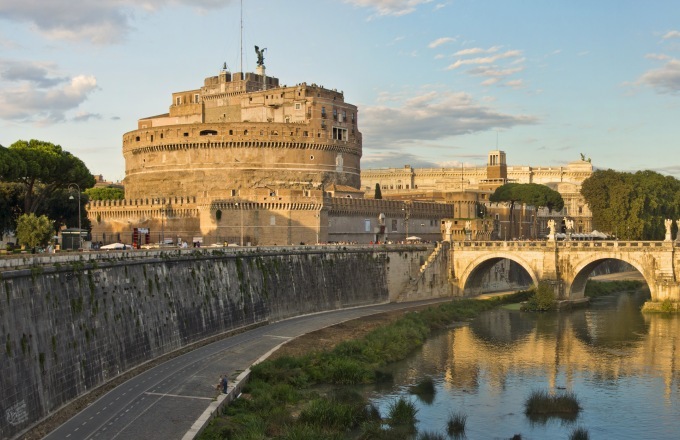 Tour the abbey, then continue to Rome, "the Eternal City." Arrive at your well-located hotel mid-afternoon and enjoy an informal neighborhood walk led by your tour director. This morning tour the heart of ancient Rome: the 55,000-seat Colosseum, built in A.D. 72 to stage gladiator spectacles, and the temples of the Forum, ancient Rome’s political and legal center. The afternoon, explore the Borghese Gallery on a guided tour. This afternoon is free to explore on your own, with endless possibilities such as visiting the Pantheon, the city’s best preserved ancient building; tossing a coin into the Trevi Fountain; exploring any number of renowned museums and churches; or simply sipping espresso in beautiful Piazza Navona. Visit the Vatican for a tour of St. Peter’s Square and Basilica, and the Sistine Chapel in the Vatican Museums. Highlights include Michelangelo’s Pietà in St. Peter’s, considered one of the greatest sculptures of all time; his frescoed ceiling of the Sistine Chapel, now restored to its original glory; and art-filled St. Peter’s itself, the most important church in all Christendom. Leaving Rome, travel north through a pastoral landscape of gentle agricultural land bounded by mountain wilderness and dotted with traditional villages and medieval hill towns. Mid-afternoon reach Orvieto, perched high on a plateau above a vineyard-clad plain. After checking in at the hotel in the heart of the city’s medieval quarter, enjoy an informal walking tour then attend a simple cooking demonstration followed by dinner at Zeppelin Restaurant. This morning embark on a guided walking tour of this dramatically set city. Visit the medieval Duomo, featuring a frescoed chapel by Fra Angelico and Luca Signorelli’s masterpiece, The Last Judgment. Next explore the formerly secret passages of Parco delle Grotte, a labyrinth of underground caves used since Etruscan times. The remainder of the day is at leisure. Set off for Assisi, considered a gem of an Umbrian town with inviting plazas, flowers everywhere, buildings of white marble, and a pervasive medieval air. Visit St. Clare Church and the renowned Basilica di San Francesco, the burial place of St. Francis and a sacred pilgrimage site that dominates the town. Inside are Giotto’s priceless frescoes The Life of St. Francis. There’s time on your own to stroll the fountain-splashed piazzas and to enjoy local specialties for lunch. Return to the hotel late this afternoon. Leave Umbria today for the equally alluring region of Tuscany. Stop along the way in Deruta, known for its prized hand-painted Majolica ceramics, and in charming Perugia. Late afternoon reach Villa Lecchi, a restored 18th-century country villa hotel outside Siena. Tonight’s dinner at this small family-run villa is the first of several here featuring savory Tuscan fare. Siena's ochre-colored buildings and ancient ramparts evoke the city’s medieval past. Spend the day exploring this fascinating medieval city, with its fan-shaped Piazza del Campo, one of Europe’s greatest public squares, and its Duomo, one of Italy’s finest. Enjoy a guided walking tour that includes an inside visit to the Duomo, housing masterpieces by Michelangelo and Donatello, then have free time to explore and have lunch on your own. Return to the hotel for dinner together. A living monument to the Renaissance, Florence is the crown jewel of Tuscany. Experience this splendid city on a full-day excursion that includes a morning walking tour. Together visit the Galleria dell’Accademia to view Michelangelo’s sublime David, as well as his sculptures for the papal tombs; and visit the revered Duomo, with its stupendous dome by Brunelleschi. This afternoon is free to enjoy Florence as you wish before returning to your hotel, where you dine tonight. Encounter classic Tuscany today as you visit the hill town of San Gimignano, known for the 13 watchtowers that have left its skyline virtually unchanged since medieval times, and visit the 1300 Museum there. Later visit a local winery and enjoy a tasting before returning to your lodgings mid-afternoon. Leaving Tuscany today, travel through the Veneto region to Venice, arriving early this afternoon. Begin enjoying this wondrous city on your own. This morning take a guided walk through vast St. Mark’s Square and surroundings. The afternoon is free to explore Venice independently. This evening, bid “arrivederci” to Italy and your fellow travelers at a farewell dinner. Day 17: Depart for U.S. Depart early this morning for connecting flights to the U.S.